Instead, the EEU is seen as a tool to trap Russia’s near abroad in Moscow’s orbit, ensuring that none of its members forge closer ties with the European Union. The EEU’s treaty impedes members from negotiating their own association agreements or trade deals with the EU. With that in mind, some observers found it strange that Russia would seek to expand the union’s reach to countries outside both the post-Soviet space and the European Union’s sphere of influence. Nevertheless, the EEU has signed agreements with Asian nations like Singapore and Vietnam, and with countries in the Middle East, Africa, and Latin America. Cambodia is no exception. In May 2016, Cambodia’s Prime Minister Hun Sen, a strongman who has maintained his grip on power since 1985, signed a memorandum of understanding with the EEU during a trip to Moscow. Then, on February 15, Tigran Sargsyan, Chairman of the Board for the EEU, traveled to Phnom Penh to meet with Hun Sen and kickstart the collaboration. But while the partnership may seem unlikely, the commencement of trade between the EEU and Cambodia is beneficial for both sides, even if the economic rewards aren’t astronomical. 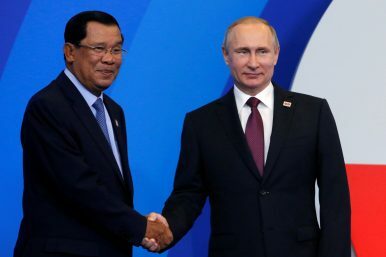 The Association of Southeast Asian Nations (ASEAN), of which Cambodia is a member, features prominently in Russia’s foreign policy, which has moved eastward in the wake of Western sanctions on Russia. Cambodia, meanwhile, has plenty of reasons to cement its ties to Russia. The Kingdom has an unsettled $1.5 billion debt with Moscow that harkens back to the Soviet era. Cambodia has requested multiple times that the debt be forgiven, but all of its pleas have been rebuffed. Some analysts have speculated that Russia is refusing to write off the debt in order to secure the position of Russian businesses in the Kingdom. Hun Sen has offered to repay part of the sum by giving preferential treatment to Russian companies. As a result of this entwined history, the two countries have tightened the screws on their relationship over the past year. The same week Sargsyan went to Cambodia, Nikolai Patrushev, director of the Russian Federal Security Service (FSB) and a top adviser to Russian President Vladimir Putin, met with Hun Sen in Phnom Penh’s Peace Palace to discuss joint counterterrorism efforts. In 2016, Cambodia’s foreign and defense ministers traveled to Moscow for meetings. And the two countries moved forward with a pact that could see Russia helping Cambodia develop nuclear energy capabilities. The bolstered alliance also makes sense in the context of Cambodia’s increasingly complicated relationship with its traditional Western allies. Cambodia has been performing its own Eastern pivot in recent years, forging a new strategic alliance with China in exchange for substantial investments in the agriculture and construction industries, among others. In return, Cambodia vocally backs the “one China” policy and derails any efforts by ASEAN to take a strong stance on the South China Sea disputes. The partnership has helped nurture economic development in Cambodia without the pesky requirements that the government respect human rights or democratic processes. Chinese investment gave Cambodia the leeway to delay the renewal of a memorandum of understanding with the UN’s Office of the High Commissioner for Human Rights until the body paid lip service to Cambodia’s sovereignty. Former opposition leader Sam Rainsy, who resigned on February 11 after Hun Sen threatened to dissolve the party he led, has said that China enables human rights abuses in the Kingdom by offering no-strings-attached loans. Similarly, ties with Russia do not require checks and balances. And lately, Chinese and Russian business interests seem to be increasingly well suited to each other. Over the last several years, Russia has been among the biggest beneficiaries of investment from China’s One Belt, One Road (OBOR) initiative, which seeks to develop infrastructure to connect Asia to Europe and the Middle East. Direct investment from China increased significantly over that period, along with Russian exports to China. The two countries have even floated the idea of officially linking OBOR with the EEU. The partnership would focus on removing customs red tape or synergizing intellectual property laws, but so far no large-scale investment projects have come from it. Nevertheless, it does demonstrate a certain symbiosis in the realm of trade policy. For Cambodia, both China and Russia have the funds and technology to increase the output of the Kingdom’s energy sector, a coveted goal for the government. This dynamic has led to a situation where Cambodia purchases everything from essential oils and alcoholic beverages to iron and fertilizers from Russia. In 2016, Phnom Penh also imported harnesses, handbags, and unspecified “animal gut” from Kyrgyzstan, and vehicle parts and rubber from Belarus. Aside from some clothing, however, trade with Armenia and Kazakhstan is still nearly nonexistent. In total, Cambodia exported $153 million worth of goods to the EEU countries between 2013 and 2016, and imported nearly $21.5 million worth of products from the EEU during the same period, according to Cambodia’s Ministry of Commerce. While those figures are small compared to Cambodia’s trade with other Asian nations, and much less significant than trade between Cambodia and the EU, Ministry of Commerce official Sophari Soeng said that could change in the future.